Cockspur rum was founded by Valdemar Hanschell in 1884. He was of Danish descent and came to Barbados via the Virgin Islands where he had worked for several years in the ship brokerage business. Settling in Barbados, which had become one of the biggest shipping ports in the Western Hemisphere at that time, he founded a ship chandlery, supplying to visiting ships – ropes, sails, salt, fresh fruit, meat and of course rum. 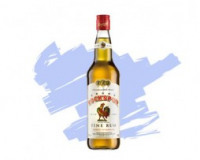 Through the years, business thrived and so too did the popularity of Cockspur rum.